Newton, MA and other cities now require owners to submit stormwater management plans for construction projects. All stormwater shed by impervious surfaces such as roofs, patios, and driveways must be retained on-site and is not allowed to drain on to neighbors' properties or on to city streets. Typically the stormwater runoff is viewed as a problem; it is generally captured in downspouts and drains and then conducted, out of sight, to underground dry wells that hold the water while it percolates slowly in to the ground. We wondered...why not celebrate rain events by creating water features in the garden, and why not let the rains irrigate the gardens? The total roof area of this new home and garage was 3,942 square feet. By designing a green roof for the garage, the area of impervious surfaces was reduced to 2,765 square feet. 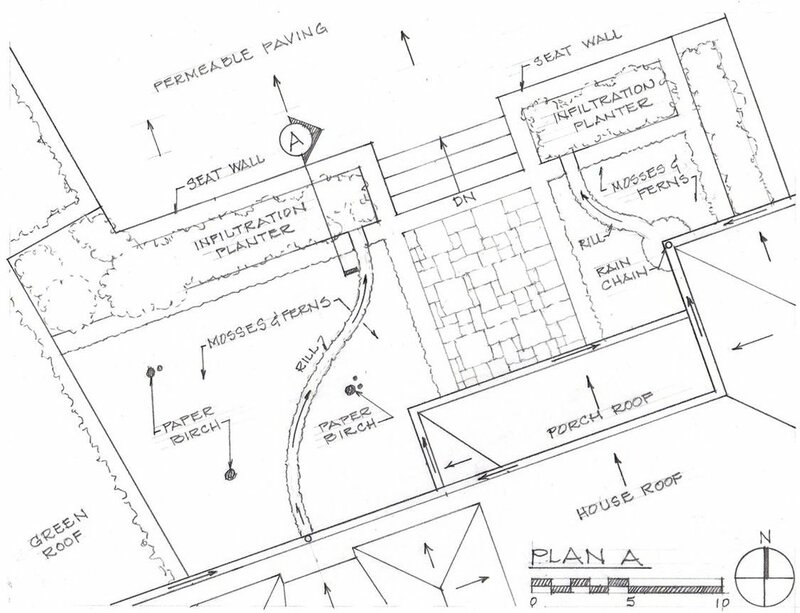 Our initial proposal was to channel the rainwater from the remaining roof surfaces to gardens and infiltration planters in the surrounding landscape. In the end, the owners preferred the idea of creating a wall fountain fed by rain and collecting the water in a cistern to supply their landscape irrigation system. Inside the 30,000 gallon stormwater cistern.